As a mom of three children, including a needy three month old baby, I have learned to tidy and clean whenever I have a small burst of energy and two free hands...and meals are prepared and dishes washed. In reality, these bursts of energy do not happen very often. mop one bathroom floor on my hands and knees. fold a bit of laundry. put away a bit of laundry. scrub a toilet and wipe a sink. 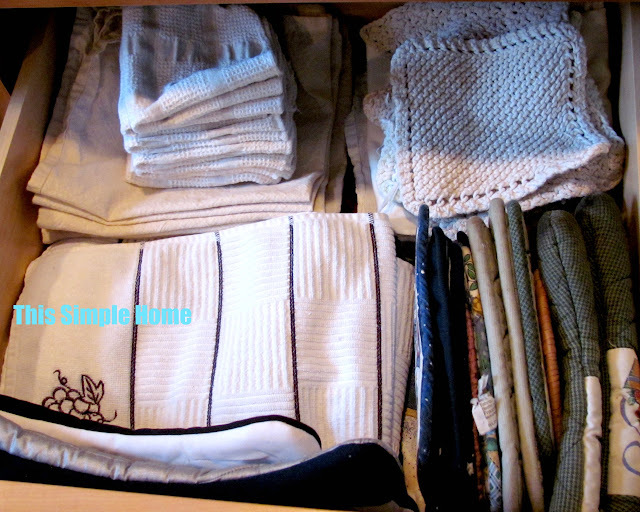 This past week I emptied and emptied my drawer that holds my potholders, dish towels, dishcloths, and cloth napkins. It was horrendous. What can you do in 20 minutes? AND I really need to clean my drawer again! Ha ha ha ha, I was trying to put together the 3 month old comment, it's still a relevant topic. Ha ha! I have very little time for blogs these days, but happened across this post and I thought I missed the news that you had another baby!!!! LOL...I was wondering about the 3 month comment! ;) But, it's very timely for me! Bumblebee has been BY FAR my neediest baby! We pretty much have to hold, tote him around, or wear him in my carrier a *large* part of the day. When he's happy, I aim for the dishes, bottles, and laundry first. As long as those chores are halfway caught up I'm not as stressed. Thankfully, when Jonathan is home, he will hold Bumblebee, so I can do a bit more deeper cleaning. It still looks like a tornado swiped through. :S This shall pass all too soon, though. Well, Little Sister is nearing 2 and most days it's all I can STILL do to feed the kids and attempt some dishes or laundry. My drawer no longer looks like it does in that photo! Very realistic idea - what can we do in 20 minutes? I always try to find something to organize like a pile of papers, getting rid of recipes that I have doubles of, organizing my pictures. Much can be done in 20 minutes!